Fly fishing is a popular summer pastime in the high Rockies, woven into both the social and economic fabric of countless towns throughout Colorado. Yet a hot, dry summer is stressing our local watersheds and with over two thirds of the state currently experiencing drought conditions, Colorado Parks & Wildlife has implemented a number of voluntary fishing closures over the summer months. What is the connection between water temperature and fish health and how can anglers take responsibility to help ensure that our fisheries are robust for generations to come? I recently sat down with fishing guide Ryan Lokteff of Divide Environmental and Mapping and an UCRWG affiliate to find out the how’s and why’s of CPW’s voluntary closures. In addition to meaning less available habitat for fish, lower water levels translate into higher water temperatures, with an increase of only a few degrees drastically impacting aquatic life. Temperature is the primary driver behind every interaction in a stream ecosystem, impacting how fish, bugs, and plants and algae interact. Colorado fish are cold blooded and adapted for a life in the crisp, cold snowmelt runoff that comprises our watersheds in the high Rockies. The optimal water temperature for these alpine-adapted fish is under 60 F – at this temperature fish are eating a lot, growing a lot, and just all around happier and healthier in the cooler waters. Warmer water stresses them out by causing a drastic increase in their metabolism, requiring them to seek out significantly more food just to meet basic metabolic needs. This means that they’re not really growing, as all of their energy intake is going toward just staying alive in the warmer waters. Once water temperatures hit 65 F, fish are stressed out beyond what they can handle. Warmer water also means less dissolved oxygen in the water, with trout having difficulties using available oxygen at 70 F and above. In water temperatures at 70 F and beyond, Colorado fish are essentially suffocating. Fish fight back when they’re hooked, with their struggles using up precious metabolic energy. It can take them up to a day to recover from the stress of being caught, with recently released fish seeking out a hiding place to rest and recover after being thrown back. Hooking a fish in water near 70 F means almost certain death for that fish once let go. The combination of the high energy expenditure and shock of being caught with a heightened metabolic rate and decreased food intake from warmer water temperatures makes it highly unlikely that those fish anglers are snapping a selfie with on hot summer afternoons are living too much longer after being thrown back, as it becomes impossible for them to physically eat enough to stay alive. Since dead fish don’t spawn, casting a lure into waters that are 65 F or above and reeling one in can significantly impact the future health of the fishery. Constantly check the water temperature wherever you’re fishing. While 70 F is a threshold past which any responsible angler shouldn’t fish, 65 F is an even better cutoff for our local fish. A reliable stream thermometer is essential in any fly-fishing kit and should be used constantly – conditions can vary widely in the same stretch of river and will be changing throughout the day, so keep your thermometer handy to repeatedly check water temperatures. Set your alarm. Head out early, as water temperatures will be coolest first thing in the morning. Shadier stretches of water at higher altitude will naturally have cooler temps, so strapping on your hiking boots and climbing for your cast may be your best option. Lakes are another option if your favorite stretch of stream is heating up, as fish can escape warmer temperatures by diving down deeper to find cooler waters. Be mindful of the fish. If you do hook a fish, be mindful of how you handle it. Keep it in the water as much as possible as you snap your photo and remove the hook. If you can, try to use barbless lures or flattened hooks to lessen the stress of being caught. Know your watershed. Knowing where water is flowing and at what levels can also help you decide where to fish. Online tools such as UCRWG’s recently released Watershed Snapshot can help you determine where the cooler waters are flowing. Having a real-time map of where water is flowing in our watershed is critical to monitoring and protecting overall watershed health, and one of the tools we here at UCRWG are working to consistently provide in the future. You can find daily stream flow conditions throughout Colorado from the USGS here, and an up-to-date list of CPW fishing closures is available here. . If water temperatures are just too warm to fish responsibly but you are still itching to get your feet wet and be a little bit closer to a Cutthroat Trout, you can always nerd out with your cell phone and a stream thermometer and do a little bit of citizen science. While monitoring the world’s watersheds is a lot of work, two different projects – CrowdWater and Stream Tracker – are trying to crowdsource the collection of streamflow data through smart phone apps. Here at UCRWG we like to hop on iNaturalist as well. 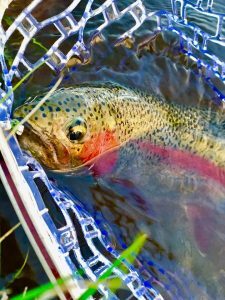 On a hot summer day during a drought, catching hydrologic data and releasing it into the worldwide web can be a great way to show your love for Colorado fish.